Observed at Kitale, Kenya, April 2013. 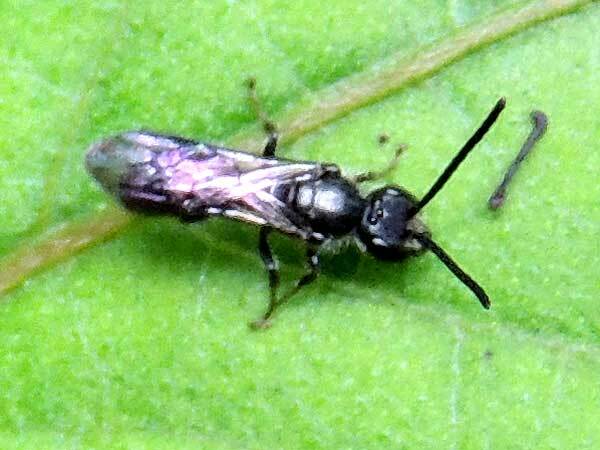 The bee is about 7 mm long. From Wikipedia: The Halictidae are a very large and nearly cosmopolitan family of bees consisting of small (> 4 mm) to midsize (> 8 mm) bees which are usually dark-colored and often metallic in appearance. Several species are all or partly green and a few are red; a number of them have yellow markings, especially the males, which commonly possess yellow faces, a pattern widespread among the various families of bees. They are commonly referred to as sweat bees (especially the smaller species), as they are often attracted to perspiration; when pinched, females can give a minor sting.